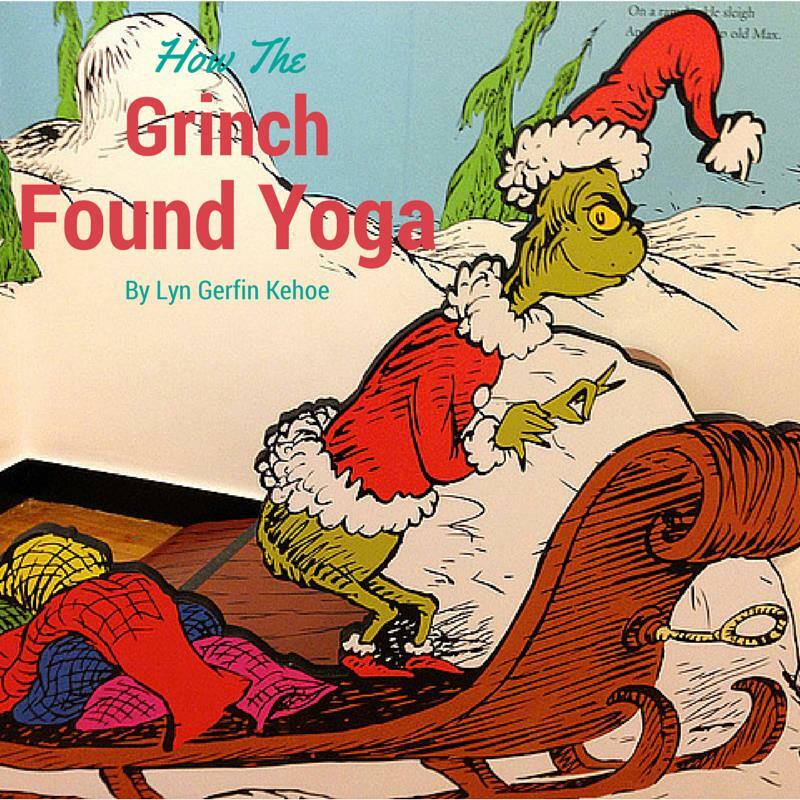 But the Grinch, who lived just west of Yogaville, did not! Now, please don’t ask why. It would only be torture. The Grinch came from the outside and found his way in. He stepped onto a mat, without expectation. Love Dr. Seuss? Love yoga? Buy Lyn’s book, Om, the Poses You’ll Do! Yoga Teachers and Studio Owners: Let’s be sure to practice asteya, when sharing please give credit to the author. Oh the horror! The horror!!! It’s sometimes interesting how a tiny little thing, like a piece of tape, can create such a strong reaction. For those of you who take class at my studio, well, you know what I am talking about. For those who have not yet had the pleasure, well, I am speaking of mat markers. Yup, those dreaded little shapes we tape to the yoga studio floor to line up our mats. Now, for those who know me, you can laugh and say my use of markers has a direct correlation with my mild case of OCD. And, I would not disagree. But if you really know me, then you will also understand that there is a bit more to it. I am talking about SAUCHA. Or PURITY, CLEANLINESS. In yoga philosophy we have these things called the Yamas and Niyamas. (Now, before your eyes glaze over, read on…) Basically, they are ethical and mindful observations, practices, restraints. These would be the things that we try to practice on a daily basis. The part of the yoga practice that we talk about doing OFF our mats. The part that has nothing do with how flexible we are or whether we can touch our toes. You know, the living our yoga part of yoga. Some are pretty obvious practices: Satya/Truthfulness, Ahimsa/Compassion (or Non-Violence). And though the meanings might seem obvious, each one actually has many layers to it. And so it is with Saucha. The yamas and niyamas also tend to overlap. It’s impossible to practice one without some of the others getting into the mix. Which, of course, means this is about more than just cleanliness. On its most basic level, when we talk about Saucha, I probably don’t have to really spell it out. Cleanliness of body, our environment. On a deeper level, we would be talking about purity of mind. The intentions behind our words and actions…the why, the motivation. Is it from a place of compassion rather than selfishness? Of course, I am putting this in its most simplest terms. Since our practice on the mat is considered a training ground for our life off the mat, in our classes we try to apply mental and physical practices to help bring awareness to these things. (We are sneaky like that.) I mean, when it comes down to it, practicing yoga is really about becoming more aware. And, hopefully, someday these practices begin to show up after stepping off our mats. And that’s where those dreaded mat markers come in…. Over the course of many years, I have watched how students react to their practice and surroundings. And, of course, I have also observed my own actions and reactions. I do firmly believe that the way we approach our yoga mats and treat the surrounding area when we practice is a good gauge on how we treat and approach life and the world in general. If we tend to take care with how we place our mats, our towels, and water bottles. (Do you really need your sweatshirt, watch, socks right next to you when you practice? Um, that’s what those things at the end of the room are for. We call them cubbies). If we are aware of our space and treat it with respect. (Those 5 towels your brought with you, do they need to be thrown in a messy pile in the space next to you? really? I mean, really?). Meaning not just the physical act of keeping our space neat and clean, but how we move within that space. If we understand how any movement we make, any energy we bring to class, not only affects ourselves, but those on the mats next to us. Especially when those markers are placed way too close for our own comfort zone. (Guess what, we do that on purpose…it’s a test. Mhmm, you heard me. It’s a test.) If we take time to slow down, and BREATHE, move with the intention that the ONLY reason to do anything in the process is because it feels right. If we start with these simple little practices, how can they not eventually reach beyond the space of our yoga mat, to the bigger things? So, next time we have the urge to move farther away from others when they put their mat down next to ours, or feel the need to have not only our mat with us while we practice but the whole kitchen sink, too, or perhaps try to force ourselves into a pose we might not be ready for… instead, we take a moment and reflect on the bigger meaning. Maybe we embrace the idea of connection rather than more distance (I promise if you accidentally touch the student next to you when you practice, your world won’t end as you know it. Hmm..maybe it will add to some growth), we embrace the flexibility of adjusting to our environment rather than forcing our environment to adjust to us (yup, that wall behind you is NOT going to move out of your way, maybe you need to bend your leg a little when you lift it up behind you or adjust your position on your mat), we embrace the idea that we are enough and clarity is not found in clutter (I think I mentioned those cubbies already…), we embrace finding contentment in the process rather than forcing an outcome, we embrace taking a breath first…making each movement purposeful and with good intention. After all, how we do the little things, is how we do the big things. Because the reality is, all of those things require flexibility, but none of those things require being able to touch our toes. Being flexible in our minds is what makes us strong. I guess what it comes down to is, if a simple little thing like a mat marker on the floor can lead to a bigger thing like more mindfulness…well, that’s significant….